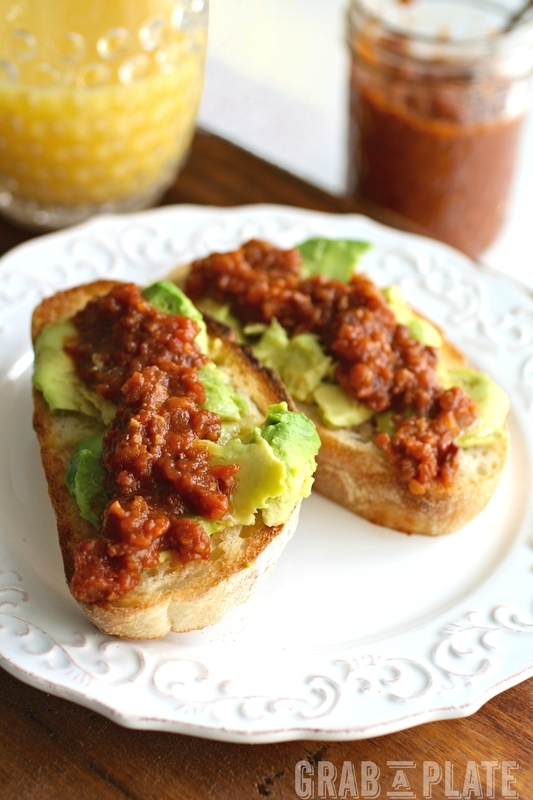 Tomato-Bacon Jam with Avocado Toast is a simple dish with flavors, colors, and textures that combine to captivate you at the kitchen table. The first time I tried bacon jam was in Seattle (I know, right? Thank you, Seattle!). It just sounds like something that shouldn’t work, but it does. Like peanut butter and marshmallow fluff. Let’s just say bacon jam works. It works really well. One you taste your first spoonful, I guarantee you’ll think of a bunch of ways to incorporate this savory jam into your life: I love it as a topping for eggs, and spread over a burger instead of ketchup or mustard. But I must say, one of my favorite ways to use this jam is to spread it on Avocado Toast. The rich and creamy avocado and the crunchy bread combo is already divine, but the jam delivers something heavenly. I love that I can have Tomato-Bacon Jam on Avocado Toast pretty much whenever I’d like. There’s no extensive canning process to make the jam, and this recipe makes about a pint, so you’ll finish it off in no time. It should last in the refrigerator for several days, and when you run out, you can easily whip up another batch. This is an easy-to-make, laid-back breakfast that feels indulgent, so try it on a Tuesday to make things feel more like a Saturday. Celebrate big the rest of this month, because September is #NationalBreakfastMonth. 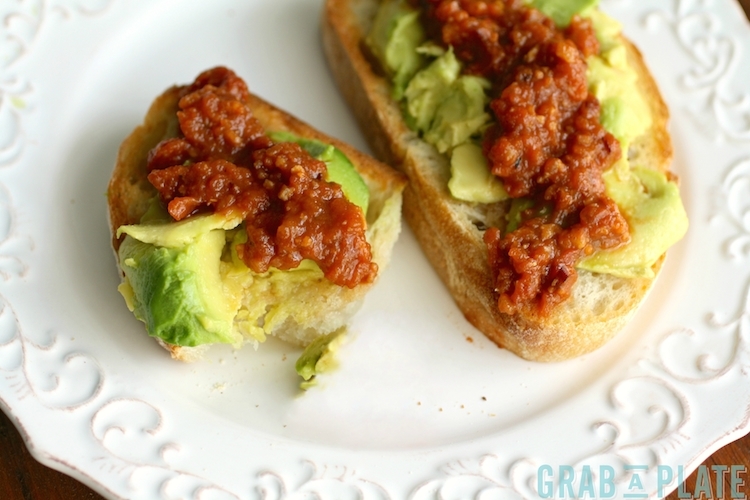 Not that you need a reason to try Tomato-Bacon Jam with Avocado Toast. I used Jones Dairy Farm Cherry Hardwood-Smoked Bacon for this recipe. As it cooks, you’ll smell the aroma of sizzling bacon, and then some. This bacon has a slight sweet-and-smokiness to it without being heavy. Jones Dairy Farm is celebrating National Breakfast Month with its Rise, Sizzle & Shine Breakfast Recipe contest. Check it out and cast your vote for your favorite finalist recipe. Once you try Tomato-Bacon Jam with Avocado Toast, you’ll understand my love for this simple dish. And the Tomato-Bacon Jam? You’ll thank me later. For another dish that incorporates savory jam, try my recipe for Roasted Brussels Sprouts with Chipotle-Bacon Jam. I’d like to thank Jones Dairy Farm for sponsoring this post. All opinions here are my own. Thank you, readers, for supporting the brands I love. You'll love how indulgent this dish seems. It's easy to make and a delight for breakfast! Try using the jam as a topping for eggs or your favorite burger, too! Cook the bacon in a skillet, turning once, until browned. Place the cooked bacon on a plate lined with paper towels to absorb any excess grease. When cool to the touch, dice into small pieces and set aside. Add the tomatoes and their juices, the orange juice, zest, balsamic vinegar, maple syrup, Worcestershire sauce, salt, black pepper, and chili powder to a bowl and mix to combine. Taste and adjust the seasoning as needed. Set aside. Add the olive oil to a large skillet over medium heat. When hot, add the onions and cook for 3-4 minutes, or until they begin to soften. Add the garlic and cook for about 30 seconds. Add the tomato mixture and the bacon to the skillet with the onion and garlic. Increase the heat slightly and cook at a low boil for 10-15 minutes, stirring occasionally, or until the mixture reduces by about 2/3. Remove from the heat and bring to room temperature. Add the mixture to a food processor or blender and blend until somewhat smooth, but with some small chunks remaining. Serve over toast spread thick with mashed avocado. Refrigerate any remaining jam, which should keep in the refrigerator for several days. Refrigerate any remaining jam. It should last in the refrigerator for several days. Jones Dairy Farm is a sixth generation family-owned and operated company based out of Fort Atkinson, WI. Their products are certified gluten-free, and are made with premium ingredients and contain no fillers, binders, preservatives, allergens or MSG. For 126 years, Jones Dairy Farm has been committed to delivering high-quality products that customers can feel good about eating and serving their families. For more information on Jones Dairy Farm, visit JonesDairyFarm.com, and follow them on social media – Facebook, Twitter, and Instagram. Absolutely love this, especially that jam! Absolutely love this. That jam sounds so incredibly good. Thanks so much, Matt! Hope you give it a try! Can we discuses that I am reading this post and commenting on it on my way to Seattle for the IFBC!!! How funny! 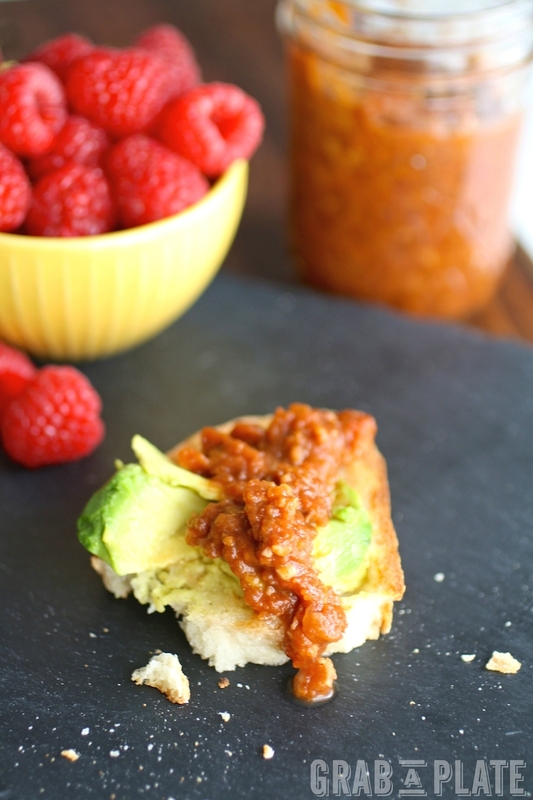 So, I love this vibrant jam and paired with the avocado…well talk about a yummy no-brainer!!! How fun! I hope you have a great time and learn a lot (I'm jealous)! Thanks for stopping by & who knows what you'll try in Seattle! I'd love to make this for a cocktail party -- bet there are some lovely California wines that would pair well with it! Great idea, Maris! Thanks for stopping by! I've never had bacon jam, but I've always wanted to try it! Sounds so good! You should try it! It's really easy to make! Thanks so much, Heather! I first had bacon jam on the opposite coast--Charleston, SC. I was in love! I have made it myself, but can't quite get the consistency right. Yours with the addition of the tomatoes looks perfect! Now I need to try it myself! Yum!!! How fun, Dee Dee! I love Charleston (so much great food, too)! I hope you give it a try! Your bacon jam recipe looks amazing. I wouldn't have thought that avocado toast could get better, but I bet the bacon jam takes it to the next level. Thanks for sharing. I know! I love avocado by the spoonful, and the jam make it even better ;) Thanks so much, Carol! What a genius idea for on top of avo toast! 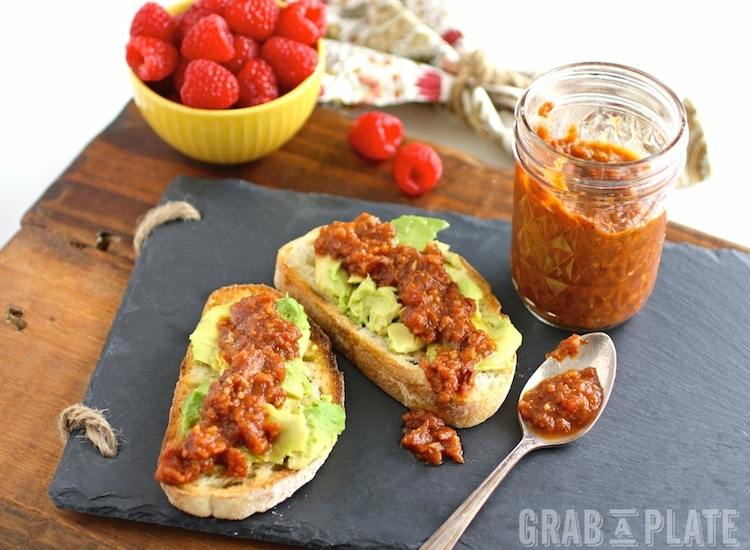 I love tomato jam - what a great addition to avocado toast! I am totally drooling over that toast. I have wanted to try a tomato bacon jam for the longest time. If I could have just reached in an taken a spoonful from your jar, I would! Thanks, Kristen! I hope you give it a try - it's so easy to make! I have made bacon jam before but not with tomatoes. I certainly never thought to add it to my avocado toast! Genius! Thanks for my new breakfast! Thanks, Jennifer! It's super yummy, so I hope you give it a try! What an amazing way to start your morning - Pinned! Oh I'm sure after that first taste of Tomato bacon jam I'll put it on everything I eat!! It looks and sounds incredible! Yep! That's how it usually works ;) Thanks so much, Tanya! This looks amazing, my mouth is watering just thinking of those flavors together. 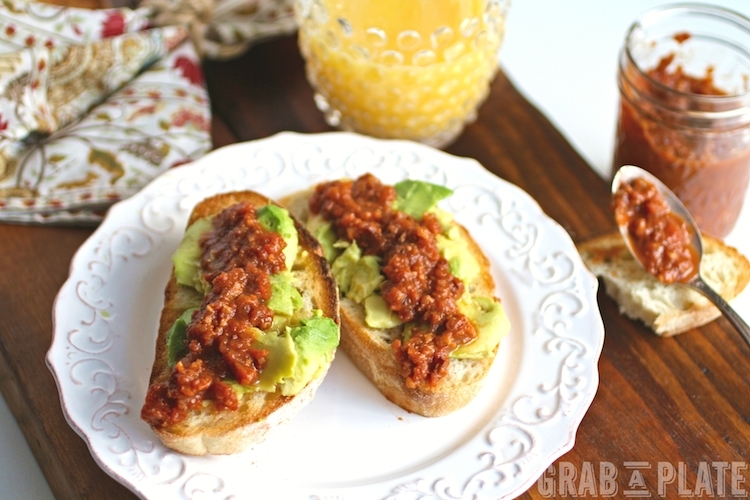 Tomato Bacon Jam on avocado toast sounds amazing! Add a small piece of lettuce and you have yourself a BLTA appetizers. Yum! Hi Kathy! What a great idea! I hadn't thought of that! :) Thanks for stopping by! Looks fantastic. Such a great idea. Can't wait to try it. Thank you, Susan! Hope you give it a whirl and enjoy! Oh, yum! Such a wonderful looking recipe! Thank you for sharing!! Have a wonderful weekend ahead! Thanks, Ashleigh! Hope you enjoy the weekend, too! Thanks, Jennifer! Let me know what you think if you do make it! I love coming over to your blog and seeing such beautiful photos. Thank you for sharing them all with us. Thanks so much for your kind words, Trisha! That means a lot! Yummy, everything is better with bacon! I'm definitely trying this one. Haha! Yes, for sure, Pamela! Thanks so much! Bacon jam! That sounds absolutely wonderful! Looks so so good! And I love avocado... and I love bacon! Hi Clare! Think I really think you'd like this :) Thanks for stopping by! That jam...oh man that jam! I could just eat with a spoon. Did you say tomato bacon jam?? My head is spinning out of curiosity, omg this is so perfect and on that avocado toast its pure deliciousness! Yes! It's really tasty, and so easy to make, Katalina! Hope you give it a try. Thanks for stopping by! Made the bacon tomato jam for the avocado toast and served it as an appetizer, It was beautiful and everyone loved it. Then I used the leftover bacon jam as the condiment on meatloaf sandwiches and it was a super hit! Loved it! That's great to hear! So happy you & yours loved it! I love tomato jam! I haven't had bacon in it, so I will have to try this recipe. They have a tomato jam that they serve at one of my favorite breakfast places with their egg sandwich and the combo is delicious! So good on eggs...and so many other things! Thanks so much, Carly! Thanks so much, Lu Ann! This sounds absolutely amazing. I have two questions re: measurements. - First, I don't have access to the brand of bacon you used in this. So, do you have any idea how much six slices weigh? I generally have thick slice bacon, so I can imagine that it weighs more than what is required. - Second, how much does this recipe make? I plan to give this as gifts and / or as part of potlucks at work. I sure don't want to run out of jam before I run out of jars to fill. Hi Tracey - thanks for your kind words! First, this recipe doesn't make a large portion -- just about 1 pint worth. I haven't tried, but imagine it would be easy to double the recipe, but otherwise, maybe work in a few batches if you have more than a few pints to give out. Regarding the weight of the bacon... If I remember correctly, I'd say I used about half of the 1-pound package of the Jones Dairy Farm bacon - therefore, I would say about 1/2 pound of bacon should work for you. I hope that helps you! Bacon jams are the best! Love the tomato in this one and combined with avocado?! Yum! This looks so divine! I usually find that the "simple food" is often the best! That's so true! Thanks a bunch, Laura! So, hold up... You just made bacon spreadable?? YES!! :) Love the idea of this avocado toast. Ha! Yes - good way to look at it :) Thanks, Carrie! This looks incredible! I could probably eat all of these in one sitting!